Spike Lee speaks after he is awarded the 20th Annual Dorothy And Lillian Gish Prize, Oct. 30, 2013. It’s official: since launching in April 2009, over $1 billion has been pledged to fund more than 57,000 projects on the crowdfunding website Kickstarter. Over half of that amount has been pledged in the last year alone, on projects ranging from open-source nanosatellites to a film about Navajo prophets. Kickstarter’s guidelines prohibit raising money for causes, or “projects endorsing or opposing a political candidate” – there’s a different website for that. But, just as politics extends beyond the Beltway and state houses, a closer look at some of the over 5 million projects funded by the site reveals a few fundraising efforts that address policy issues or document political life in one form or another. It’s like Risk for those less interested in cavalry and more into millage rates and property tax exemptions. City Council blew past its funding goal of $7,500, netting $23,000 for the first board game to glamorize zoning laws and liquor board applications. In City Council the goal is to keep down unemployment, pollution and crime while creating jobs and managing a budget. This could be the future of civic education as we know it. If you’ve been wondering where to find Sean Astin since his memorable performance as Sam Gamgee in the Lord of the Rings trilogy, you haven’t been looking hard enough. Last year Astin raised over $66,000 for his bipartisan political talk show, Vox Populi. Online since 2012, Astin raised the money to bring his production into primetime by hiring a staff and building an app. So far, the reviews are good with Astin being praised as a civil, sincere host. Part of the growing Kickstarter-to-Netflix pipeline, filmmaker Jarreth Merz raised over $33,000 in just 30 days to promote and distribute “An,” a film documenting the 2008 presidential election in the West African state of Ghana. Merz achieved unprecedented access to the major candidates, gaining jaw-dropping footage of rural political rallies where crowds swelled into the tens of thousands. At first blush, there’s nothing overtly political about a toy engineering set marketed towards girls, but that was until they decided to co-opt the notoriously ad-phobic Beastie Boys, juvenile 1987 single “Girls,” for their online ad. A couple of lawsuits and an open letter later the song has been removed from the ad, but the larger question about fair use versus parody remains unsettled. Even before his recent jeremiad against the dark side of gentrification, Spike Lee was raising eyebrows by turning to Kickstarter to fund his filmmaking. Lee’s use of the Kickstarter platform to fund his project raised hackles from business media criticizing the filmmaker for taking donations away from lesser-known creators who lack a traditional fundraising network. The outrage even drew a response from the Kickstarter blog. At the end of the day, the project was funded to the tune of $1.4 million, with 29 backers earning a courtside seat to see the Knicks at Madison Square Garden with Spike for the price of a $10,000 pledge. Though they may not have taken home a statue last night, the producers of The Act of Killing, the 2014 Academy Award-nominated documentary on Indonesian mass-killings, are trying to strike gold again, and this time with Kickstarter. The film follows a pair of idealist politicians trying to address the challenges of peace and democracy in their home country of Columbia. They are trying to raise $60,000 by the end of the month to wrap up post-production on the film, and a $1,000 pledge nets a pair of tickets to the premiere in Copenhagen. With shrinking education budgets and selective redistricting impacting urban education nationwide, the REALM Charter School in Berkeley, California may be pioneering a way forward for schools that lack strong support from local taxes or state governments. A group of 10th grade students managed to raise over $16,000 to build their own classroom out of shipping containers. Instead of using the money to hire contractors, the students designed and constructed the building themselves learning how to use everything from circular saws to digital fabrication tools along the way. Part publicity stunt, part hip-hop diplomacy, DMV rappers Pacman & Peso raised over $10,000 on Kickstarter to film a music video in North Korea and then they did it. 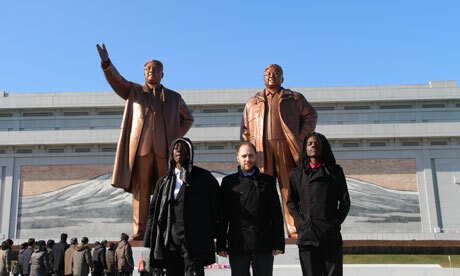 Shot in and around Pyongyang while on a highly organized civilian tour, the young duo pulled off the unthinkable and flexed in front of statues of the dear leader. Political Cartoonist and 2012 Pulitzer Prize finalist Matt Bors nearly doubled his fundraising goal to raise over $35,000 in 2012 for his 225-page graphic book. Bors’ cartoons are uniformly hilarious, with topics that range from Steve Jobs’ reincarnation as a Chinese assembly-line worker to something called the “Vaginal Avenger.” A $25 pledge was enough to secure a copy of the book, now available on Amazon. Poll: Have you ever funded a Kickstarter project?